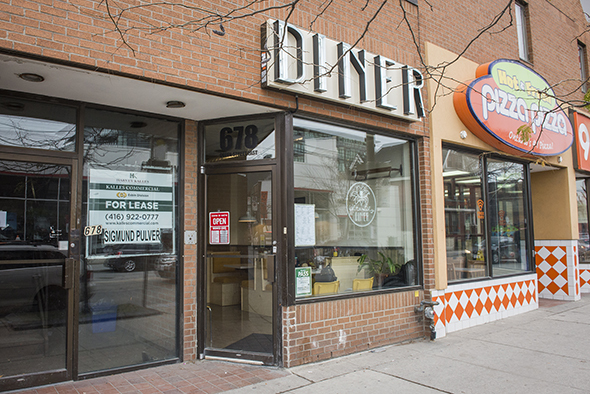 White Lily Diner is a charming spot near Queen and Broadview where the food is eclectic and elevated but stays true to pure diner values. It's sure to satisfy the hungries at whatever hour of the day you happen to wander in. 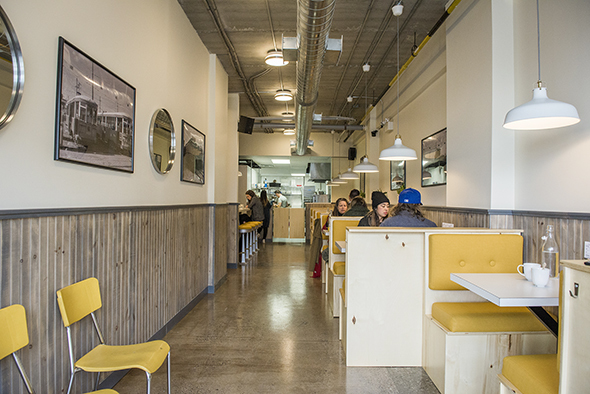 Much of the diner is outfitted in a charming golden yellow that adorns the booths and barstools as well as plastic elementary school chairs suitable for a wait or throwing a bag onto. The full English breakfast ($12) is the star here, and the star of that breakfast is the house smoked sausage which smells intoxicating and tastes juicy and just a little spicy. 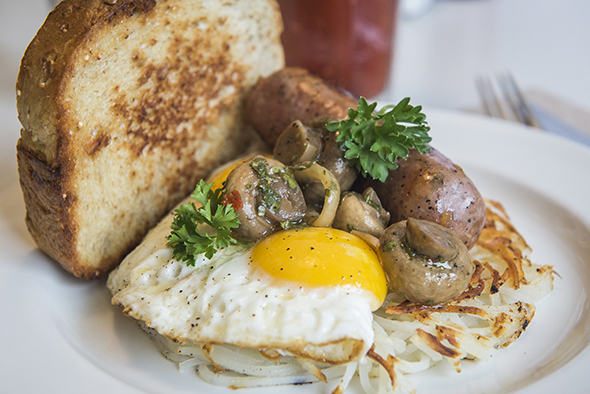 It sits atop a bed of hash browns along with sunny eggs (you can get them any style, but I recommend something runny), marinated mushrooms and house toast - I got dense and hearty multigrain. 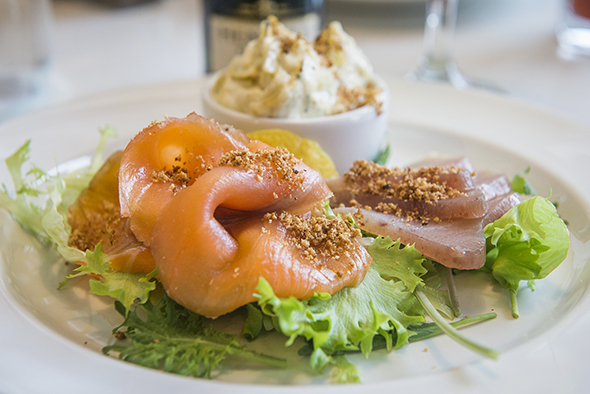 The smoked fish platter ($14 or $22) is luscious house cured and smoked salmon and albacore on a bed of lettuces topped with a delicate rye crumb that complements the super smoky clean fish well. On the side is a lemon wedge and artichoke asiago dip. The strong flavours of the fish and the dip go well together, creamy and rich. 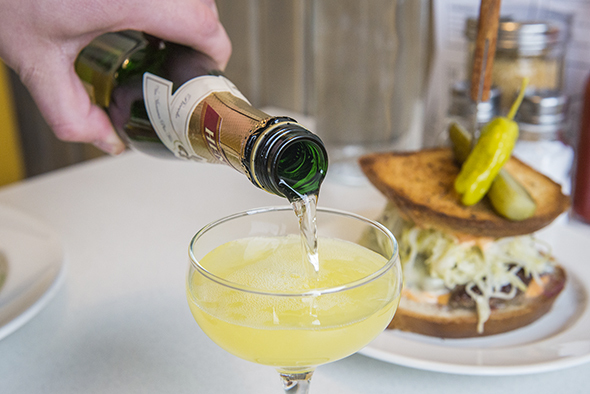 The Reuben patty melt ($14) is a beef patty with sauerkraut, Russian dressing and Swiss cheese on house rye. The house pickle on top is a super sour crunchy garlic vinegar bomb. The sandwich itself gives off Big Mac vibes in a good way. The only issue is how to attack it: fortunately you're given a steak knife. Drinks here range from wine and beer to cocktails, with the classic brunch option of a caesar ($9). 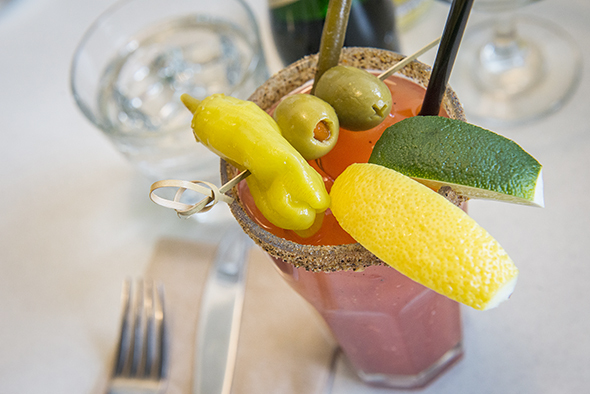 Garnished with a house pickled bean, it's a standard caesar but Montreal steak spice rim adds an excellent body to the drink. A DIY mimosa ($15) is suitable for two (or one): a mini bottle of Henkell Trocken served with a teeny carafe of orange juice. 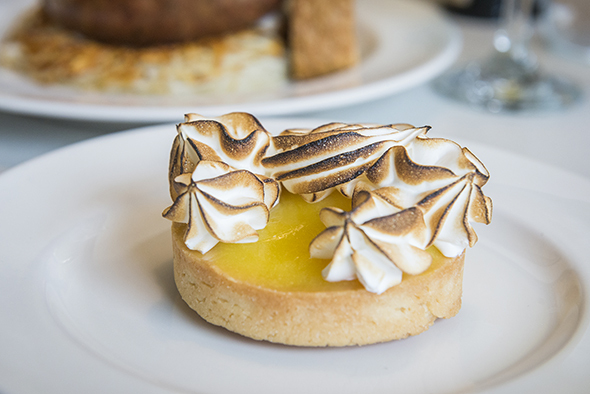 A lemon meringue ($4.5) with delightfully airy and not stiff meringue is another of their baked goods. 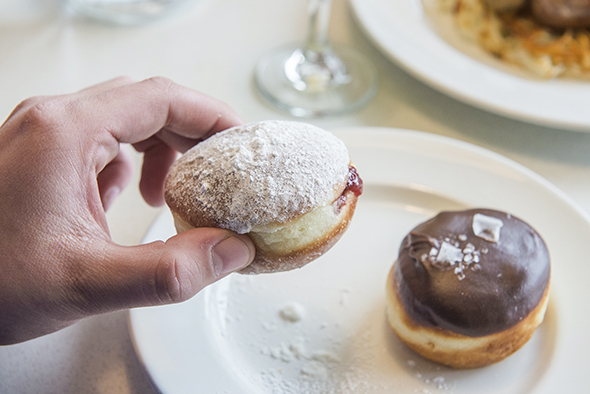 Donuts ($4.50) rotate regularly, and there's a sour cherry and a chocolate and Maldon salt on offer when we visit. 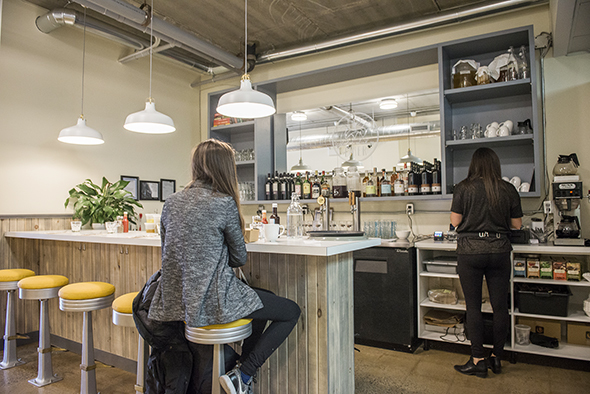 Five can sit at the bar, and there are five four person booths and two booths for two. Photos of old Riverside hang on the walls along with a photo of one of the owner's grandparents.